It can happen to any car. On your brand new car or that vintage Mustang restoration project you just finished. People and nature can be inconsiderate and car scratches are just inevitable facts of life. It doesn’t matter how much you care for your car. Those multiple layers of car wax can only protect your car so much. And when deep car scratches happen, you can depend on these car scratch remover tips. Unless your car is more than two decades old or you had it custom-painted, its paint would almost always be catalyzed enamel that has been clear coated. The exterior of your car is composed of four layers beginning from the bottom: metal, primer, paint, and then the clear coat. The appearance of the scratch depends on the depth of the scratch and the paint’s color. The depth of the scratch will affect the cost and the difficulty of the repair. Clear coat scratch - This rarely happens since the surface of the paint bonds well with the clear coat. That’s why scratches on the clear coat are almost unnoticeable, especially with lighter paint colors. Paint scratch - A blemish becomes visible when the scratch not only takes off the clear coat but also reaches the paint and worse, the primer. Primers usually have a light gray color so when that layer shows up, it means the scratch has gone through the clear coat and the paint. Scratch down to the metal - These scratches are usually accompanied by dents unless these are intentionally made. An impact from debris like a rock or bumping something hard can cause this type of scratch in which the primer, paint and clear coat have been stripped off, exposing the metal body underneath. This should be repaired as soon as possible because of possible oxidation and eventually, rust. That’s because moisture can permeate underneath the surface surrounding the scratch. When rust has started to form, your car’s paint will require a more extensive procedure to restore back to original condition. 1. Thoroughly wash and dry your car. The existing dirt on your car can cause more damage to its paint during the repair. Make sure that there is no debris on the scratch itself by spraying it with water. 2. Sand the scratched area lightly and carefully. Using a 2000-grit sandpaper, sand through the car’s clear coat and no further. Sanding the paint will make the damage more extensive. Here are more tips. - Follow the direction of the scratch as you sand. Sanding in the opposite direction will create valleys and ridges in the car’s paint. - Rinse the area being sanded periodically so you can see your progress and if you have reached the scratch’s bottom. - A scratch that has gone beyond the clear coat may need to be sanded first with a 1500-grit sandpaper, then followed with the 2000-grit one. - You can also use toothpaste to sand the area. Ordinary toothpaste has micro abrasive components that can also function as a high grit sandpaper. Just use a clean cloth, apply the toothpaste on the affected surface and wipe repeatedly until the desired effect is achieved. 3. Rinse the affected area and let dry. Thoroughly rinse the area being repaired and wipe the water off with a clean towel or cloth. Never use old rags since these can cause even more scratches. Now that the affected area has been sanded and cleaned, it’s time for the actual paint repair. You will need rubbing compound, water and soap, car wax, and a clean cloth. 1. Apply the rubbing compound - Using a buffer pad or a clean cloth, apply rubbing compound on the area. Use only a small amount and add more as needed in order to prevent further removal of clear coat. 2. Use a buffer to polish the area - Using the lowest level on your buffer, polish the affected area for 10 seconds. Rubbing compound dries fast so you need to polish it quickly. Increase the buffer’s speed to 2000 and then polish again for 60 seconds, moving your buffer around the area. Continue buffing until the area has smoothened out and make sure you don’t reach the paint layer. Do not rest your buffer in one area for more than a second. Rubbing compound is abrasive and it can eat the clear coat and paint if you buff one area longer than necessary. 3. Thoroughly wash the area again. Using a clean towel and water, remove the rubbing compound residue from the surface. Use a soft toothbrush if there are any crevices with compound still remaining. Make sure you remove the compound off immediately after you buff because it can stick to your paint and it will be a lot harder to remove. 4. Wax the affected area. Waxing the area of the paint you have repaired effectively seals it from dirt and debris, protecting it from further damage. Use good quality wax like carnauba and use a random orbital buffer to apply the wax. 5. Wash the car one more time. After the sanding, the rubbing compound, and the waxing, you should wash your car once again to remove the dirt and debris that may have accumulated during the repair process. You may also want to wax the whole car while you’re at it. Remember that wax is another protective layer on your car’s paint. 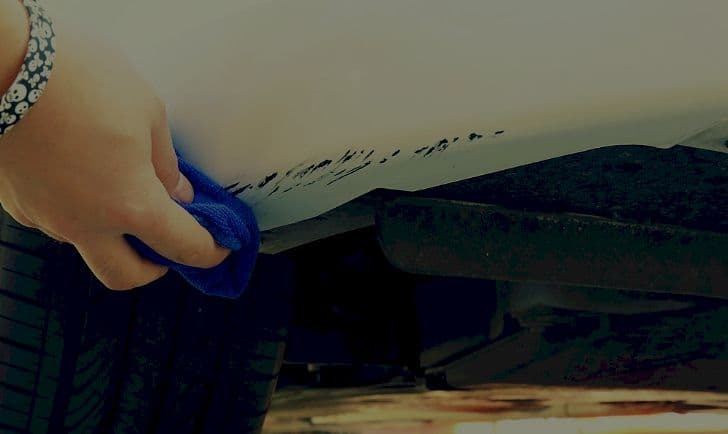 Remember the car scratch remover tips discussed here and you will be able to restore the original shine of your car’s paint. Again, clean your car and apply car wax regularly.